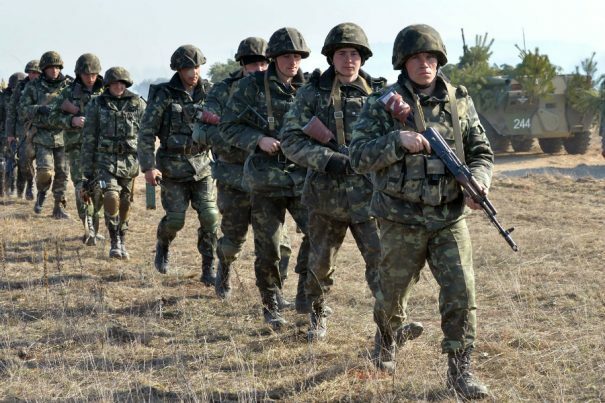 (NationalSecurity.news) The Pentagon has identified as many as 40,000 Russian troops massing at eight different points along the border with Ukraine, prompting concerns among Western military officials that Moscow is set to make a major push into its neighbor’s territory. As reported by the Washington Free Beacon, in addition large numbers of Russian forces are planning to conduct exercises in the coming days that the U.S. Department of Defense says could be used as cover for an attack on Ukraine. “Russian units will likely practice reinforcing the [Crimean] peninsula through such activities as amphibious landings and air defense exercises, and this may involve the change out of equipment and long convoys of military vehicles,” one defense official told the WFB. Included in Russian forces are troops, armor and air force units, all of which are arrayed against the former Soviet satellite state. The exercises in particular are ominous, say U.S. defense officials. That’s because similar large-scale exercises were held near Ukraine a month before Russia launched the covert military operations to take over the Crimea, a strategic Black Sea peninsula in March 2014. U.S. military officials say the Pentagon is closely monitoring the Russian excercises. Russian forces in the Crimea do not appear to be building up, according to U.S. intelligence. But that said, over the course of the past several months Moscow has moved large numbers of troops and tanks into eight bases that stretch from Yelnya, near Smolensk and northeast of Ukraine, southward through Rostov, which is a city located very close to eastern Ukraine, where Kiev’s troops have been battling so-called separatists backed by Russia. U.S defense and intelligence officials told the WFB they were not sure if the Russian troop movements were merely saber-rattling, to get Ukraine to accept Moscow’s takeover of the Crimea, or if some larger military operation was being planned. Either way, they said, the situation is being closely monitored. U.S. Rep. Mike Pompeo, R-Kansas, a member of the House Permanent Select Committee on Intelligence, said Russia is continuing aggression and threats against the rest of Ukraine after invading Crimea. Other experts said that over the next month weather conditions are perfect for moving tanks and armor into the area. Also, they said, the skies will be generally clear, allowing for air operations.